How does a Heat Pump Cool my Home? The first thing you might think of when you hear the words heat pump is that it’s a machine that has to do with heating your home, correct? Well, yes and no. Despite the heat pump’s deceiving name, they can actually be used to both heat and cool your home. Some models can even heat water. Heat pumps offer an energy-efficient alternative to furnaces and air conditioners in climates with moderate heating and cooling needs. Running on electricity, heat pumps basically move the air—moving heat from a cool place to a warm place. This means that during the winter a heat pump moves heat from the outdoors into your house to warm the building. During the summer, a heat pump will remove the heat from your house to move it to the outdoors. Because of their energy efficiency in using the air already in your home, having a heat pump can cost approximately one quarter of the cost of a conventional heating or cooling unit. Air Specialist offers two different heat pumps for our Houston clients, some of the most efficient and reliable heat pumps in the industry. 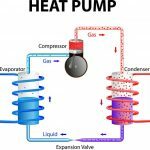 The heat pump has the ability to act as a reverse air conditioner in the winter as it moves heat into your home, and a pump that removes heat from your home in the summer. During the dead of winter you won’t find heat pumps “look” outdoors for heat. That is because even when it is below freezing temperatures outside, heat is still present. Your heat pump will find it, and transfer it inside to heat your home. If you don’t enjoy sweating and feeling sticky in the humid summer months, you could benefit from becoming friends with a high-efficiency heat pump. Not only do they save you energy and money, but they are better than traditional air conditioners at removing humidity from your home. Your heat pump cares about the environment and loves to recycle. In lieu of generating new heat, your heat pump will move heat already present indoors. They make useful and energy-efficient alternatives for people living in moderate climates or with minimal heating and cooling needs. Heat pumps can reduce the amount of energy you consume and save you money on your utility bills. You may be able to lower the amount of energy you use to heat or cool your home by up to 40%. Call Air Specialist to discuss the best heating and cooling options for your Houston area home today!